Pray for the world and live intentionally! 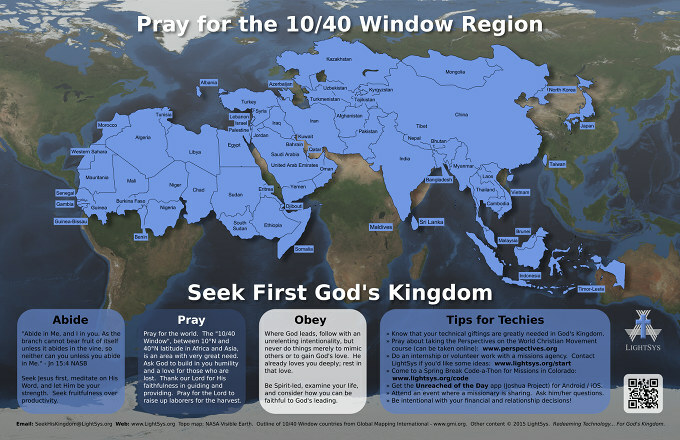 We have a 10/40 Window prayer map poster (11" high x 17" wide) to encourage and remind you in your journey with God regarding missions. Please feel free to let us know how we can be praying with and for you. It is a privilege for us to be a part of God's story at work within you. We'll gladly send you a copy for free. Just Contact Us with your name and a mailing address, mentioning that you'd like a free copy of this poster, and we'll get back with you. There are some "next steps" you can take outlined on the map (you can also find this information again by scanning the QR code on the map). Here are a few quick links you can follow to learn more. Learn about what the 10/40 Window is all about. Read about the Great Imbalance - a problem missions face where, as Joshua Project puts it, "Over 90% of all missionaries work among already reached peoples. For every dollar of Christian resources less than one penny is directed at reaching unreached peoples." While we shouldn't at all neglect the continued growth of believers in reached areas, there is a greater need among those who have never had a chance to hear. Learn more about Perspectives on the World Christian Movement, a course that provides a solid foundation for anyone desiring to live their life intentionally in the context of God's work throughout the world. Find many more resources at the Mission Infobank. Visit www.lightsys.org/start to connect with us about specific next step opportunities at LightSys. Check out www.lightsys.org/code for information about our next Spring Break Code-a-Thon for Missions. Download the Unreached of the Day mobile app for your Android or iOS phone or tablet. Learn how to more effectively pray for the countries of the world at Operation World. Connect with other missions-minded technologists, including full-time missionaries with a variety of missions, at the International Conference on Computing and Mission. Would you like an image of the prayer map to use as your computer desktop background or as a background for your tablet or smartphone? Below is an image you can download for use on your own device.